Last Friday until Thursday we had beautiful weather for the MLK weekend. Temps were warm, 40s and without much wind. That can only last so long before we skiers say, “Enough, bring the snow!” Without new snow, we avoided the southfacing slopes, and stayed high (T-bar, Imperial, E-chair, and Falcon) and skied on the east and north facing slopes. On Thursday night our prayers were answered. There was only 4 “, but it fell somewhat heavy and wet and offered some substance to cover the hard sunbaked snow underneath. It has snowed on friday night as well. I can only imagine that Vail, Beaver Creek, Steamboat, and Aspen have been in rough shape. They will need this fresh snow too. From the snow reports, it looks like the Vail resorts have all received 6” or more so far. I have been delinquent in putting together some new ski videos. Between trading and research, teaching skiing, workouts, and family time something had to give. It was creating daily ski videos with my students. Armed with my new Nikon S550 camera, I am ready to begin again. I just finished this video @ 8pm and Saturday night. Damn, the things I do for my students. Enjoy!!! I really have fun skiing with you. 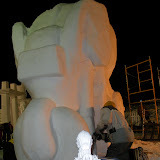 The warmer than usual temps have also hampered the International Snow Sculpture competition in Breckenridge. However, the temps haven’t stopped them from creating their own “David” from a cube of snow weighing 20 tons. Simply amazing stuff. This is the busiest, non-holiday, weekend due to the Snow Sculpture event. On Thursday we created our group skied up high, and we encountered some fast snow. We explored the difference of “slicing and dicing” vs the “butter on bread” style for speed control and turn shape. Due to the nature of the snow (variable),we were using a flatter ski approach (butter on bread). This allowed more margin for error, and would not “jet” us out of our turn on steeper terrain or moguls. As we wanted more speed we would roll to a higher edge angle a “scarve”‘ or carve clean lines in the snow. On Thursday and Friday we explored the need for versatility with Edge Control movements. One idea was to have the highest edge angle occur near the apex of the turn, and move through a flatter ski through transition. as the terrain gets steeper, we usually have the desire to have a high edge angle at the finish of the turn. The high edge angle at the end usually requires that we have some gross rotational and pressure control moves to initiate the turn. This is typically not required or desired in modern skiing, however it can be useful in certain situations. Finally we discussed tactics when skiing in tight spaces. In short, look ahead and be looking and preparing for the “crux” and what lays beyond it. What are your expected exit routes? Make a few rounds turns prior to the crux for speed and line control, and vision of what lays beyond. Most people focus on the crux (tight spot in the trees or in a chute) and then when they get there, they look for the next move. This usually causes panic and loss of flow, resulting in an ill-chosen decision on the other side. We found a dozen situations that offered practice in skiing THROUGH the crux. It is a lesson I learned in a clinic in Taos about 12 yrs ago. It was fun to watch AH-HAAA breakthroughs, even though there were a few “Hmmms” too.